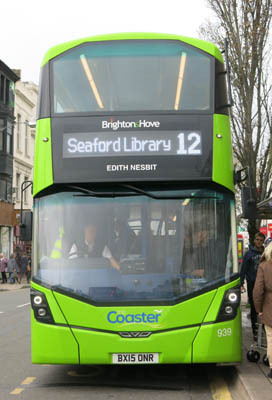 Connections with Brighton and Hove : Edith Nesbit was a well-known author with children’s books such as The Treasure Seekers and The Enchanted Castle. But by far her most celebrated work was The Railway Children which was made in 1970 into a highly successful film. She wrote more than 40 books for children and many more for adults under the name E Nesbit. A staunch Socialist, she was a founder of the Fabian Society. Born in 1858, Nesbit came to live in the hamlet of Crowlink, near the Seven Sisters cliffs, in 1911. She described her home here as “an old farmhouse near the sea, part Tudor - It used to be a smugglers’ retreat.” Nesbit was exhilarated by the salty air, wide sky and sense of space of the area, declaring: “The quiet here is like a cool kind hand on your forehead.” In 1915, she incorporated Crowlink into one of her adult romantic novels The Incredible Honeymoon with the leading characters first meeting in the nearby village of Jevington and, eventually, living happily ever after at what she called Crow’s Nest Farm. She died in 1924 aged 65. The Downs around Crowlink are now protected by the National Trust. 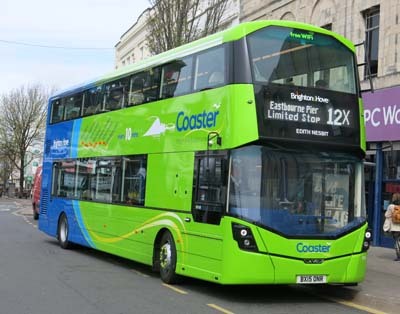 939 Mercedes Streetdeck - carried name since delivery in April 2015 on Coaster Route 12.